A collection of 24 more dances that have been time-tested in classrooms and at community dances. 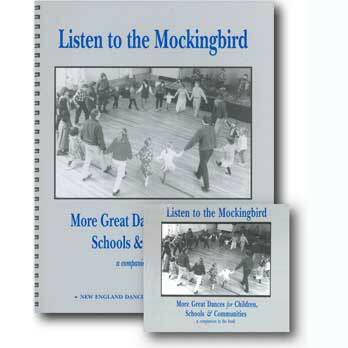 Includes longways dances, circle dances, square dances and contra dances. New chapters on teaching dance in the classroom, building a sense of community, choosing partners, tips on calling and creating new dances with children. Glossary, tune transcriptions, and combined index for Chimes and Mockingbird also included. Cassette/CD recording features some of New England’s finest dance musicians playing all the music needed to teach the dances. Reels, jigs, polka and waltz are played dance length. Four square dances include singing calls on the recording.